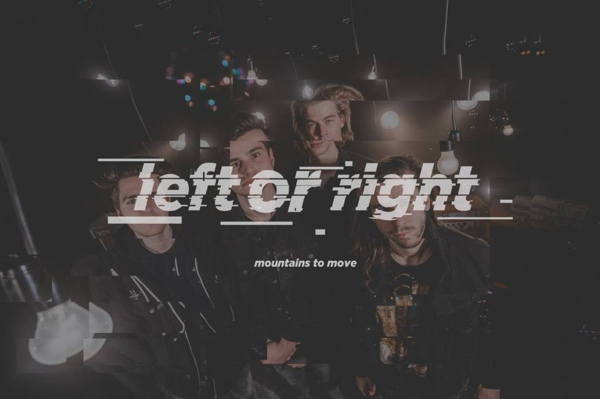 Mountains to Move have recently released their new single “Left or Right” which asks the “what ifs” of life. So we figured it was only fair we asked them our own pile of “what’s” and “how’s” with our Band of the Day questions. Having supported bands like Young Guns and Deaf Havana over their four years, the Belgians should have enough to talk to us about. We’re from Antwerp, Belgium. Some of us also live in Ghent. Three of us were high school buddies and just decided one day to start a band. Sander, a friend we met throughout the years, joined the band later. Like four years I think. It actually comes from a Seahaven song, called “Plague”. At that time we were listening a lot to this band and just were in need of a band name. The song ends with “I’ve got a mountain to move”, so that’s were the name comes from. We’re good at blending emotional and calmer parts with a blasting chorus. The bipolar contrast between heavier and softer parts perfectly also describes lyrical themes. Mostly rather personal and pessimistic stuff about how I feel at a certain point in my life. I never write about the good things that happen to me, but use this type of negative writing as therapy. Usually it has a misanthropic undertone, but also about broken relationships or self-hatred. Oh, I don’t know how many we’ve played over the years, but it’s a lot. We try to create this wall of sound when we’re on stage, trying to ‘blow away’ the audience, if that makes any sense. This combined with these extremely chill and calm, clean parts is the perfect MTM live set. We aren’t that wild on stage, but I remember one time going to a Midnight Souls show (Belgian band that has quit a long time ago, now members of Newmoon) at which their bass player, Bert, just walked off the stage into the crowd and just placed himself standing in front of someone and stared at that person for an entire song. That blew my mind. I play on a Fender strat and an orange AD30. Sander plays a Hagström and a Vox amp and Philippe on a Jazz bass and a Orange Amp. We recently released a new song called “Left or Right” and we’re extremely proud of it. We released it through Red Bull Music, which was also pretty sick. Please check it out if you’re into happy sounding music but with a sad undertone! We’re planning on releasing another song this Summer and hopefully have a physical release by the end of the year, but we’re still in search for the right partner for this! We’ve been on tour with Wallflower and Prey Drive and playing with those guys again would be so cool. It’s been a while since we heard anything from the boys in Wallflower so would love to see them again. It would be cool if both of us could open for a band like Brand New or Jimmy Eat World. From previous Band of the Day, Crejuvent: why do birds suddenly appear every time you are near? From previous Band of the Day, Nomasta: what is your favourite album for those special fuzzy tingle times? I’m in love with this record by a small band called Grandview. The album is called Everything Between Paint and a Wall and listening this record hits me in the feels every time. It’s one of my biggest recommendations if you’re into punk/emo music. And from Empire Warning: if a Norse God had to take over from one band member what god will it be, what position would they be filling? Probably Sköll, the wolf in Norse mythology.